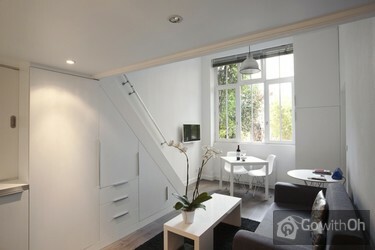 Ideally located in the centre of Paris, this beautiful two-storey studio allows visitors the chance to experience the Parisian life style and all its attractions in great style and tranquility. There is a mezzanine with a double bed. 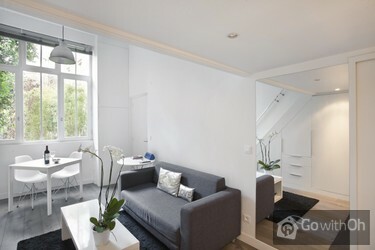 The apartment is in the lively district of Sentier-Montorgueil, with a number of services in the surrounding area including cafeterias and restaurants. 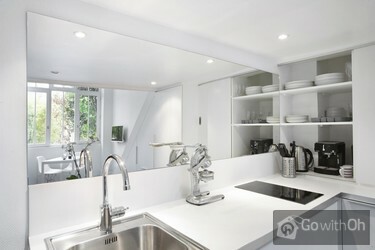 It is just a 5 minute walk to the Halles and 10 minutes to the Louvre and the banks of the Seine. Close to the studio there is the metro stations Réaumur Sébastopol (lines 2 and 4) and Sentier (line 3). Piccolo ( malgrado l'effetto specchio nella foto) e molto rumoroso ( comunicante con la porta d'entrata che viene sbattuta ad ogni va e vieni , anche di notte) , soffitto soppalco letto basso con vicini "pesanti", scorrimano scala pericolante. In quanto ai piccoli accessori che solitamente per ...educazione si mettono a disposizione dei clienti in un appartamento di vacanza soprattutto se si arriva nel fine settimana e verso sera , erano assenti (rotolo carta igienica, carta da cucina, 2 capsule macchina da caffé ... ) non obbligatorio ma é un gesto che dimostra la serietà del locatario. In generale il posto é grazioso , meritevole l'entrata e la corte nel verde con il canto degli uccellini al mattino ... ma troppo caro per l'offerta ... anche se nel deuxieme arrondissement di Parigi !!! 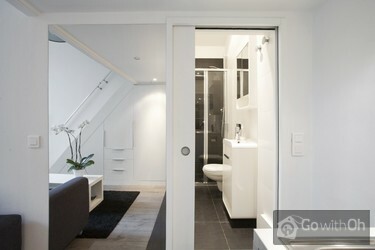 We just loved this appartment. The owners were very relaxed. It didn't matter that we arrived later than planned and we had a bit extra freedom about the time we wanted to leave. The apartment has lots of extra's and is in good shape. Owner arrived very late for check-in. Everything else was fine. Amazing location! Owner is very friendly and accomadating! De kleine beschikbare ruimte is zeer efficiënt ingedeeld. Het appartement is gelegen op een binnenkoer,heerlijk rustig. Enige minpunt is de lage zoldering boven het bed. The apartment is excellent and the owner allowed me to check in at 10.30pm on a Friday which made things easier for me. The street close by (Rue Montorgueil) is a great place for restaurants/places to drink. I had a lovely stay! The one thing that would have improved things would be to be able to ...pay the full amount for the stay electronically. I gave a cash deposit to the owner and got this back at the end of my stay, but would have felt more reassured if this could have been electronic so that there is a record. The apartment has a fantastic location. We found it very quiet and comfortable during our stay. The owner was very accommodating. It's a small, well designed space that is great for a couple. 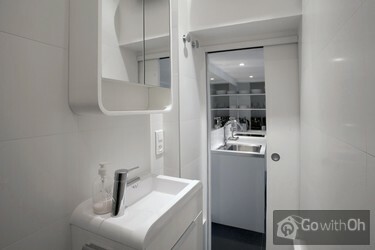 Abbiamo alloggiato nell'appartamento di Jper 5 giorni ad ottobre, abbiamo apprezzato la posizione, il fatto che si trovi al piano terra di uno stabile molto carino e la luminosità, data dalla grande finestra.Il bagno è un po' piccolino ma vivibile.L'alloggio è nuovo e pulito, cosa molto ...importante J ed il suo ragazzo sono persone davvero disponibili.Se avremo occasione di tornare a Parigi ritorneremo senz'altro qui.Dimenticavo di dire che il quartiere ha dei bei ristorantini ed è ben servito di supermercati e boulangerie. 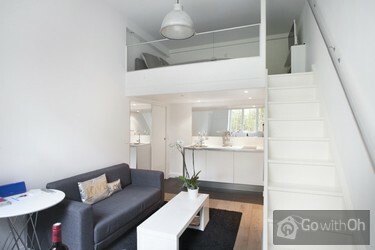 Het appartement is heel efficient ingericht, duidelijk een binnenhuisarchitect bij betrokken geweest. Alles is aanwezig. Leuk gelegen op een binnenplaats, winkels om de hoek, leuke restaurantjes.Enige minpunt zijn bank en bed, deze zijn niet comfortabel. 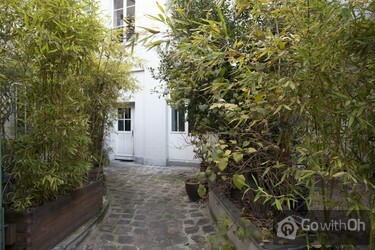 The location is excellent, close to the main tourist areas walking distance of Louvre , Marais, Notre Dame, Opera areas and at proximity of great restaurants, cafes and nice market. 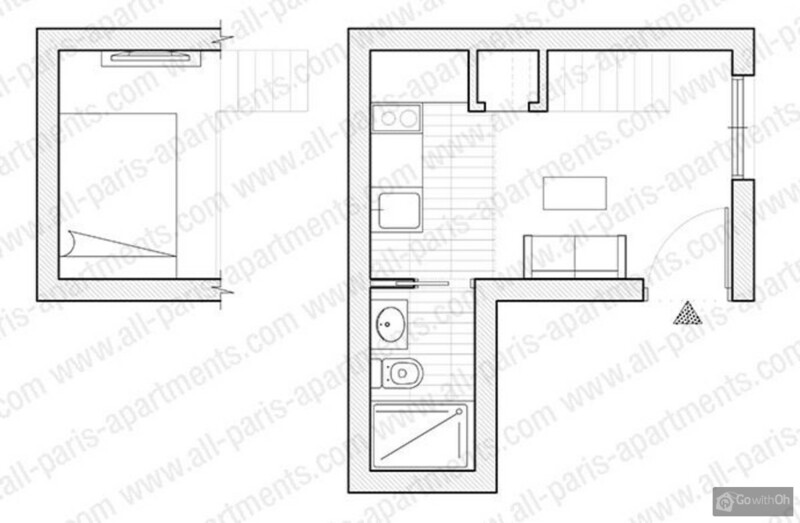 The apartment is in quiet back ward, typical Parisian.The ceiling if the bedroom is low, watch your head. 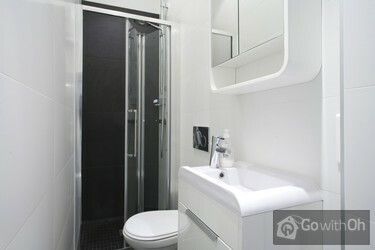 Love the place but a bit pricey for the standard.. The apartment was lovely and quiet and off the main street with a little courtyard to walk through and a little garden outside. The apartment was small but OK for two. Everything was in good working order and very close to shops, buses, metro etc. We had a great stay. We are a couple in our mid 20s and this was our first time in Paris. The location is PERFECT!!! Right in the middle of restaurants and cafes. Paris is quite big so we got around on bikes but if you're not up to that you can just jump on a tourist bus. The apartment is quite small but has everything ...you need. There is no air conditioning but it's well sheltered and is always cool (we were in Paris during 38 degree weather)! Great place. La aspiradora no funcionaba bien pero todo lo demás perfecto! Kleine, aber gut geschnittene, empfehlenswerte Ferienwohnung. Schlüsselübergabe problemlos. Die Wohnung war sehr gut gelegen und trotzdem sehr ruhig. Lo mejor del apartemento es, sin duda, la ubicación. Els bonito y bien pensado, el equipamiento es bueno pero luego hay muchos pequeños detalles que hacen que tu estancia no sea perfecta: no hay visillos y el ventanal da a la entrada del edificio por lo que no hay intimidad; el sofá es muy ...incómodo; hay un aspirador, pero no funciona; el lavabo y el water pierden agua; las toallas están viejas y descoloridas, no había recambio de papel higiénico... Una buena gestión podría cambiarlo todo. 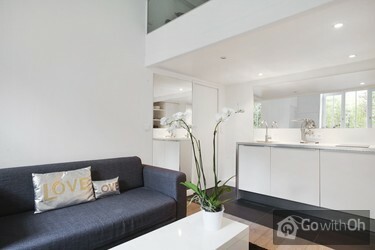 Great apartment, fabulous location with lots of restaurants and shops. Would definitely stay here again! 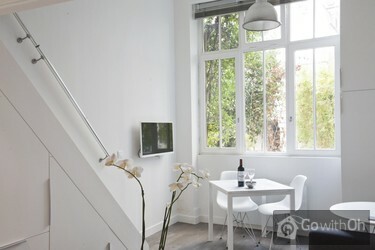 this apartment is located in the middle of the Marais, with many cosy terraces. Once you've stepped into the courtyard it's nice and quiet and you don't hear the sounds of the street anymore. 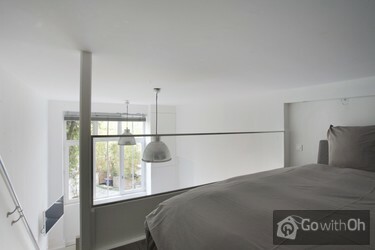 Studio très bien situé, au calme (arrière cour), toutes les commodités à proximité (quartier commerçant). Idéal pour un séjour à 2. 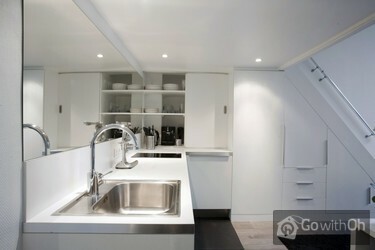 Great location but furniture was very uncomfortable and many appliances did not work. The owner was not there on our arrival or departure. The apartment was wonderful. It is exactly how it is shown in the advertisement. The only thing to be careful of if you are not used to it is the short ceiling upstairs, but once you are used to it, everything is ok. We loved our stay, and look to return again in the future! This place was just perfect! Clean, modern, comfortable. The owner made it easy to check in anytime, which was so nice when our flight was very late. The street and neighborhood are very lively and cool. It is nice not to bring bags up steps! The bed is comfortable, wifi fast. We didn't cook at all. The surrounding restaurants were too good. Thank you! Julie is a brilliant host and the apartment is perfect for a short trip to Paris. The location is incredible with loads of great shops, restaurants and bars right outside the door. 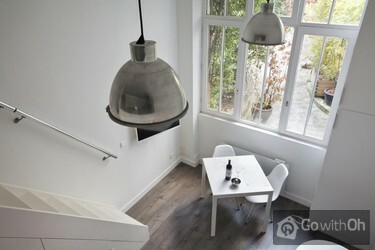 Wir haben ein paar sehr schöne Tgae in Paris verbracht.Unser Appartement war dafür ideal. Sehr zentral gelegen, mit vielen netten Lokalen, zwei Metrostationen und Supermärkten in direkter Nähe. Dennoch war das Appartement durch die Lage mit seinem Innenhof sehr ruhig. Die Ausstattung war für ...unsere Bedürfnisse genau richtig und es war alles sauber, ordentlich und neuwertig.Der Kontakt mit der Vermieterin verlief völlig unkompliziert über E-Mail.Wir haben uns rundum wohlgefühlt.